A variety of diseases in humans happen when proteins with important cellular functions are lacking or are produced in abnormally low amounts. One example is type-2 diabetes mellitus which is caused by a complex set of problems involving the use of sugars (mostly, glucose) as an energy source. After eating, sugars in food are taken up by the body, and a set of biochemical events in the gut and metabolic organs (pancreas, liver) that control the levels of sugar in the blood and that allow cells to take up and use the sugar properly are activated. When those mechanisms do not function properly, blood sugar levels can become very high (hyperglycemia) and other forms of toxicity can result. Because there are many proteins involved in this process, type-2 diabetes can result from multiple different defects in different molecular pathways. This often makes type-2 diabetes difficult to treat, in some cases it can be reversed by lifestyle and dietary modification, while in many others the use of insulin or an anti-diabetic drugs such as metformin is required alongside dietary modification in order to achieve adequate control over glucose levels. In a significant minority of cases even the combination of medication and lifestyle changes is not effective enough to prevent the consequences of type-2 diabetes, such as cardiovascular and kidney disease. A variety of novel treatments have been proposed, ranging from drugs that alter the functions of the defective proteins, to gene and/or protein therapy. In each case, the idea is to cause the proteins to be expressed and/or function normally, allowing sugar metabolism to progress optimally. Gene therapy involves causing a patient’s cells to express an artificial gene with the hope that it will, in turn, make more of a needed protein. Alternatively, therapies can involve direct administration of the protein, after it has been made by cells growing in a dish or by genetically-engineered animals (insulin treatment for type-1 diabetes is a good example). Gene therapy has many potential limitations, ranging from difficulties with the methods used to get the genes into the cells, to the fact that the cells may not express the protein in a normal amount and/or manner. Protein therapy suffers from the fact that it is very difficult to produce proteins suitable for drug treatment in large amounts or with sufficient potency and purity, meaning that these agents can be very expensive and have their own potential adverse effects. A blended approach involves creating human cells that express proteins of interest in a laboratory, seeding them into an implantable “bio-reactor” and then placing the reactor into the patient’s body. Ideally, however, the expression of the protein by the cells in this bio-reactor would be controllable by the supervising physician, who could adjust it according to the patient’s needs and response to the treatment. This requires a “trigger” that turns up or down the activity of the cells. In a paper appearing in the journal Science, Swiss scientists have now demonstrated a method for controlling the production of proteins by an implanted bio-reactor; the trigger they developed is one free of any potential side effects of its own: namely, light. To do this, they took advantage of an amazing mechanism – created by nature – that is buried deep in our eyes. Cells in our retina have proteins that sense light; when light strikes the proteins in these cells, a biochemical signal results which affects the physiology of the cell. This is the beginnings of how we see. In their article, Ye and colleagues report that theythat they used the light-sensitivity of the protein melanopsin to create cells in the laboratory that are capable of responding to light by producing a protein called glucagon like peptide-1, which promotes normal sugar balance and metabolism. They seeded these cells into a bio-reactor which they implanted just under the skin into mice that are type-2 diabetic. 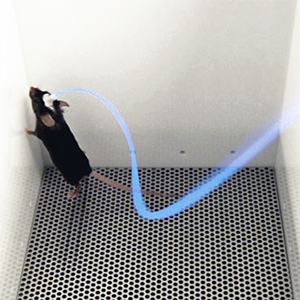 When they shined blue light onto the mice, some of it passed through the skin, reaching the bio-reactor. The cells released the protein, exactly as they were designed to do, and the secreted protein normalized the high blood sugar exhibited by the diabetic mice. Because different proteins are responsible for diabetes in different patients, it will eventually be possible to create individualized bio-reactors that restore the protein that is particularly important for that person; but in all cases, blue light can be the trigger. With that light comes the ability to control the levels of protein production according to the needs and response of the patient. None of this would have been possible without decades of basic research into the biology of the eye (including studies in frogs which enabled the discovery of the critical light-sensitive protein melanopsin), into sugar metabolism (in particular the studies in rats which identified glucagon like peptide-1 as an important regulator of insulin secretion ) and molecular genetics (which made it possible to modify the genetic structure of cells in the manner required here). Scientists working on these problems were not necessarily conducting research to cure human disease, but their discoveries laid the ground-work for these treatments anyway. Because of their enormous efforts, the new approach described by Ye and colleagues has potential for the treatment of a whole range of diseases where protein therapy is required, including cancer, liver disease and neurological problems. Once again, the future is “bright” for those suffering from those illnesses, thanks to the amazing combination of animal models and new technology. Posted on June 29, 2011 July 3, 2011 by David JentschPosted in News, Science NewsTagged animal models, animal research, animal testing, diabetes, mice, mouse, Optogenetics.